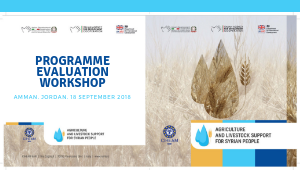 On September 18, Amman, in Jordan, will host the Program Evaluation Workshop as part of the "Agriculture and Livestock Support for Syrian People" Project. The event will be attended by all the Donors present in the Syrian scenario, most of the International Organizations and all the Western Embassies present in Amman. Since 2015, “Agriculture and Livestock Support for Syrian People” has been actively supporting Syrian rural communities to improve their capability to face and adapt to a new war-shaped economy, providing agricultural and livestock inputs and services, strengthening the skills of local communities and creating income generating opportunities for women. All activities are developed addressing the specific needs and problems of farmers, breeders and women in close collaboration with the Local Council Administrations (LCA). The programme works through a network of local technicians who play a pivotal role in ensuring a direct dialogue with the rural communities, capturing their needs and identifying the necessary actions to be implemented. The strong link with LCAs and the local associations (women and technicians), encourages the reconciliation between different ethnic and religious groups by increasing dialogue, agricultural work and economic exchanges. In 2018 an external evaluation has been conducted to analyse the programme impacts on the Syrian rural communities. The evaluation has proved the effectiveness of the programme in increasing the food availability in the intervention areas through better crop yields, promotion of livestock animal capital resulting from a far better access to inputs and services. Highlighting the results of the program to the international community is the main purpose of this workshop.